Earth, Air, Fire, and Water are the Greek Classical Elements, in which Air plus Water becomes Moisture, Water plus Earth becomes Cold, Earth plus Fire becomes Dry, and Fire plus Air becomes Hot. In short, these four Classical Elements are things that you can touch and feel, and things on earth that lives depended upon. In Chinese, Wu-xing consists of two Chinese words, i.e., Wu 五 and Xing 行. Literally the word Wu 五 means the number 5, but the word Xing 行 in fact is not easily translated because it has two pronunciations: one being Hang2 using the phonetic transcription of Han-yu Pin-yin漢語拼音, while other being Xing2. Xing2 has the meanings of movement. If Xing2 行 combines with another Chinese word Xing1 星, then it means moving star, or precisely known as the Planet 行星. However, if you ask the Chinese people what is Wu-xing, most of them will answer without any slightest doubt by simply saying they are Metal, Wood, Water, Fire and Earth. They are pronounced as Jin1, Mu4, Shui3, Huo3 and Tu3 respectively. Because of which, people consider Wu-Xing which widely used by Chinese Metaphysics as the western counterparts of Elements. Instead of Four Elements, the Chinese has Five Elements. Some of them even try to find their equivalence as what Wikipedia did. The words Metal, Wood, Water, Fire, and Earth are the direct translations of the Chinese words Jin1 金, Mu4 木, Shui3 水, Huo3 火, and Tu3 土, but that does not mean they will share the same physical properties of their English counterparts. 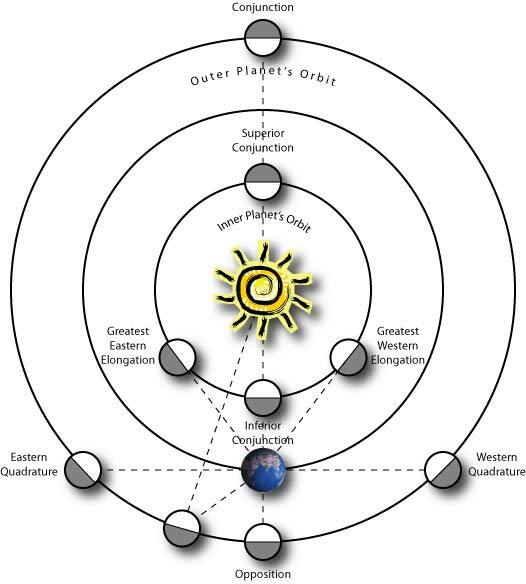 Chinese ancient philosophers believed that things on earth are subjected to the influence of, not just the Sun and the Moon, but also the other 5 planets of our solar system. They are namely Venus (or Jin-Xing 金星), Jupiter (or Mu-Xing 木星), Mercury (or Shui-Xing 水星), Mars (or Huo-Xing 火星) and Saturn (or Tu-Xing 土星). Obviously these are the planets that our ancestors could possibly see with their bare eyes. Our ancestors might not know what exactly these influences were and just called them Energies or Qi 氣. In terms of Qi that are widely used in Chinese Metaphysics and Medicines, people thought they are abstract and mysterious. Using modern physics however, it is just Energies, like electromagnetic field, gravitational force among celestial bodies in our universe. As such, unlike their western counterparts, Wu-Xing 五行 is not something that we can touch and feel. In terms of color, Metal is metallic and thus shinny as white (mostly), Wood (especially trees) is green, Water is dark and thus black, Fire is orange red and Earth obviously yellow. These are called the Five Colors 五色 of Wu-xing. It is simply because Venus appears white and shinny and was called Tai-bai 太白 (or Jin-xing 金星). Jupiter appears as greenish as wood and plants and thus was called Sui-xing 歲星 (the yearly star or Mu-xing 木星). Mercury appears tiny and a bit dim as compared to Venus and thus was called Chen-xing 辰星 (or Shui-xing 水星). Mars appears reddish and was called Yin-huo 熒惑 (or Huo-xing 火星). Finally, Saturn appears yellowish and was called Tian-xing 填星 (or Tu-xing 土星). Our ancestors named these five planets according to their colors. 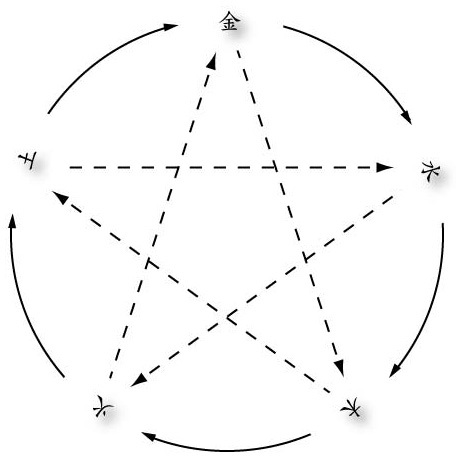 Having said that, the ancient China astronomers developed a set of powerful but interesting interactive relationships among them using the physical properties of these five elements. We can therefore call them the properties of, but should never call them elements. These interactive relationship are basically Vitalization (or Sheng 生), De-vitalization (or Ke 剋), Opposition (or Chong 沖) and Conjunction (or He 合). These terms may sound weird and awkward, but they reflect the true meanings of these interactive relationship. I do not have much objection to the use of Creation or Generation in lieu of Vitalization, but obviously the meaning of the Chinese word Sheng 生 is to give life to rather than to create from nothing. As such, the meaning of the Chinese word Ke 剋 is to take life away from. I do have strong objection to the use of Clash for Opposition and Combination for Conjunction, because these two terms are astronomical terms for special astronomical phenomenon. If two celestial bodies are having 180 degrees apart in Ecliptic Longitude, they are in Opposition. Obviously we are observing from the Earth as the reference point. If they are however having the same Ecliptic Longitude, they are in Conjunction. With these definitions in mind, perhaps you will have different understandings of Chong 沖 and He 合.